Photo: Lockheed Martin / All rights reserved. If the two parties reach an agreement in the summer, the training of Bulgarian Air Force pilots and ground crew will commence no later than 2021, Lockheed Martin quoted its international business development senior manager Jim Robinson as saying in a statement on Thursday. 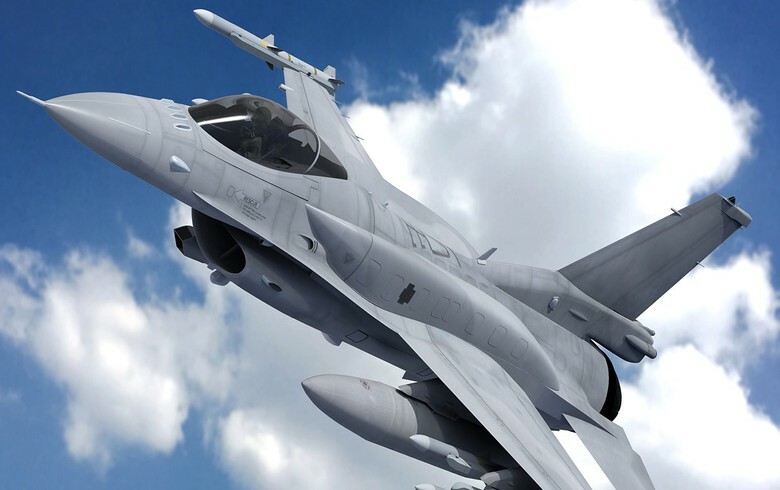 The company is due to launch in two weeks' time a new aircraft manufacturing facility in Greenville, South Carolina , where the F-16 jets for Bulgaria could be made if a deal is signed. In addition, as part of its commitments, Lockheed Martin will open a maintenance, repair and overhaul (MRO) facility in Bulgaria, where local engineers will be responsible for the maintenance of the F-16 jets during their 12,000 flight hours lifespan. According to Lockheed Martin, Romania is also looking into the possibility of acquiring more jets, while Croatia is reviewing the needs of its air force. Bulgaria's parliament mandated the government in January to launch talks with the US for the purchase of F-16 Block 70 jet fighters. In October 2018, Bulgaria said that the U.S., Sweden and Italy have responded to its request for proposals for supply of up to 16 jets to replace the ageing fleet of Russian-made combat aircraft of the Bulgarian Air Force. The U.S. offered to supply new F-16 or F-18 jets, Saab offered to supply new Gripen C/D fighter jets, while Italy offered used Eurofighter aircraft. Subsequently, Saab improved its bid and offered to deliver 10 jets instead of the initially proposed eight. In June 2018, Bulgaria’s parliament approved a plan for the acquisition of NATO-compatible combat aircraft in two stages. The first stage envisages the purchase of no less than eight aircraft for an estimated total of some 1.8 billion levs ($1.1 billion/ 920.3 million euro). Bulgaria's transport ministry said that its tender for awarding a 35-year concession contract to run Sofia International Airport, worth an estimated 3.5 billion euro ($4.4 billion) VAT excluded, has attracted five offers. The candidates to operate Bulgaria's largest airport are four consortia led by foreign companies, and the local unit of German airport operator Fraport AG Frankfurt Airport Services Worldwide, the ministry said in a statement late on Thursday. The tender required the participants to state which company would act as operator of the airport. Fraport Bulgaria is offering Fraport AG Frankfurt Airport Services Worldwide to run Sofia Airport. Two of the consortia are led by French companies. One of them is led by Meridiam Eastern Europe Investments, with Flughafen Munchen to act as airport operator, while the other is led by Aeroports de Paris, which will also act as airport operator, and includes Aeroports de Paris' Turkey-headquartered unit TAV Havalimanlari Holding. The other bids came from a consortium led by Swiss-based SSB Sauerwein & Schaefer Bau with Copenhagen Airports A/S as airport operator, and a consortium comprising Britain's Manchester Airport Group Overseas Investments Limited and British-registered BCEGI Construction, a wholly-owned unit of China's Beijing Construction Engineering Group. The transport ministry did not say which company will act as airport operator under the offer submitted by the consortium formed by Manchester Airport Group Overseas Investments Limited and BCEGI Construction. The tender commission will now assess whether the bids meet the tender requirements and the eligible offers will be opened on May 9. Spanish natural gas and electric utility group Naturgy Energy said on Friday it has signed a deal with Duet Private Equity Limited for the sale of its entire stakes in the capital of its subsidiaries in Moldova for a total of 141 million euro ($159 million). The transaction is part of Naturgy's efforts to focus on its strategic regions and businesses with a view to maximizing shareholder value, according to the company's development plan for 2018-2022, Naturgy, formerly known as Gas Natural Fenosa, said in a statement. The transaction is expected to occur before the end of June 2019 and is subject to certain conditions and approvals. The deal's value includes dividends before closing and is not expected to generate significant capital gains for Naturgy, the company said. The subsidiaries in Moldova that Naturgy is selling are electricity distribution company Red Union Fenosa and electricity trading company Gas Natural Fenosa Furnizare Energie. Naturgy owns 100% of both subsidiaries. In January 2018, Red Union Fenosa denied media reports, according to which its owner Gas Natural Fenosa has launched the sale of its assets in Moldova, but confirmed that several companies have shown interest in a potential acquisition. Naturgy is currently present in more than 30 countries, where it serves almost 18 million customers, with 15.57 GW of installed capacity and a diversified electricity generation mix. It has been operating in Moldova since 2000, servicing over 800,000 customers via its two subsidiaries, which are engaged in electricity distribution and sales in the central and southern regions of the country, including the capital Chisinau. Duet Private Equity Limited is a venture capital firm specializing in investments in early stage, emerging growth, turnaround, growth capital, buyout, real estate and infrastructure. Serbia aims to attract investors willing to produce electric vehicles in the municipality of Loznica, where Anglo-Australian mining group Rio Tinto is developing the Jadar lithium-borate project, the mayor of Loznica, Vidoje Petrovic, said. "We hope that investors from the automotive sector may come to Loznica to produce cars and machines powered by lithium batteries," Petrovic said in a video file posted on the website of Serbian news agency Tanjug on Sunday. Rio Tinto discovered the lithium borate deposit in the valley of Jadar river, near the town of Loznica, in western Serbia, in 2004 and plans to start production in 2023. Jadar is estimated to contain 10% of the world's deposits of lithium, the primary raw material for the production of batteries for electric vehicles. According to Serbian media reports, Jadar is the main advantage of Serbia in the race for attracting a project for construction of a car factory by Volkswagen in Southeast Europe. "Our goal is to have finished products besides the semi-products, in order to involve a larger number of citizens and companies," Petrovic said. Earlier this month, Marnie Finlayson, the country head for Serbia of Rio Tinto, said the company is drafting the project documentation for the construction of the Jadar lithium borate mine. Under current plans, Jadar will be an underground mine, with the opportunity for future expansion if demand warrants it, daily newspaper The Australian reported in March. The Jadar lithium borate discovery in Serbia is estimated at 135.7 million tonnes with a weighted average concentration of 1.86% of lithium oxide, representing one of the largest lithium deposits in the world.